I bought this in 2001 when I was travelling a couple of times a year to San Francisco to events such as the annual Sun Microsystems analyst meeting. There are a handful of Savings and Loan shops in the less touristy places – areas where people will ask you for money on the street and your middle class American friends advise you not to go. I really like these shops, because their owners tended to undervalue their stock, minimising the loan value on the assets. Although I didn’t realise it at the time the pound’s rising value against the dollar made buying secondhand saxophones even more attractive. It’s all changed since then – the pound hs declined significantly in value and eBay makes all saxophone values knowable for the shop owners. I also believe that these instruments are a finite resource – they got pawned years ago. I can’t find many interesting saxophones any more in San Francisco in these shops – I joke with my friends that I bought them all. This horn was one of the first I bought from America. 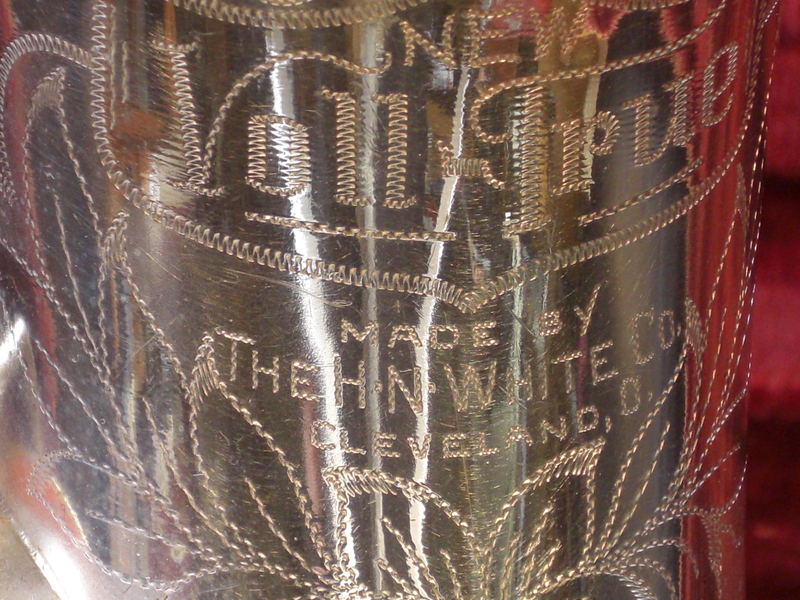 As a silver plated instrument uncleaned for decades it was almost black and hidden at the end of a dusty glass cabinet. It cost me a couple of hundred dollars, which I had to pay in cash. It took a few hours to clean it up. I took all the keys off and wiped it with silver polish. My saxophone fixer repadded the horn, which gave him the opportunity of soaking the body in a bath of silver polish along with the keys once the old pads had been taken off. Mine is a II. 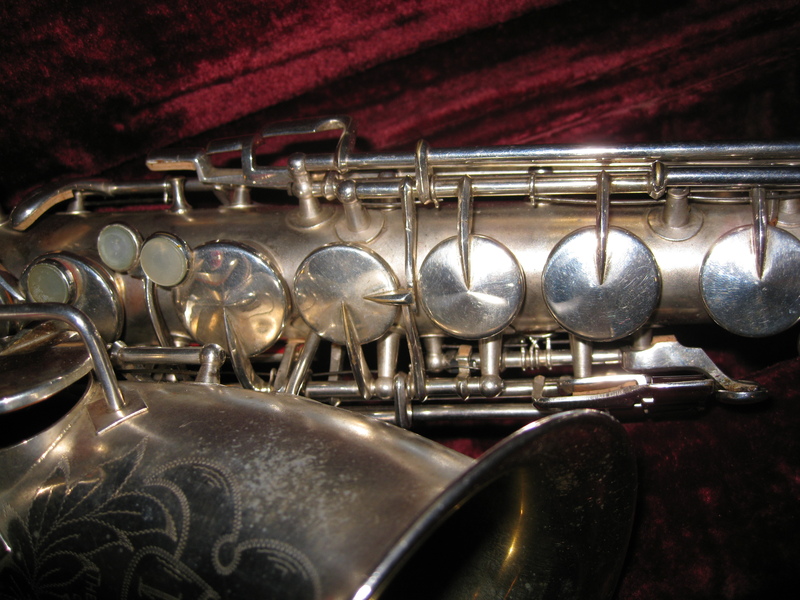 King saxophones are distinguishable by their coned key tops, as you can see in the pictures. This is a ‘flapper’, with the bottom keys on both the left and right hand side. 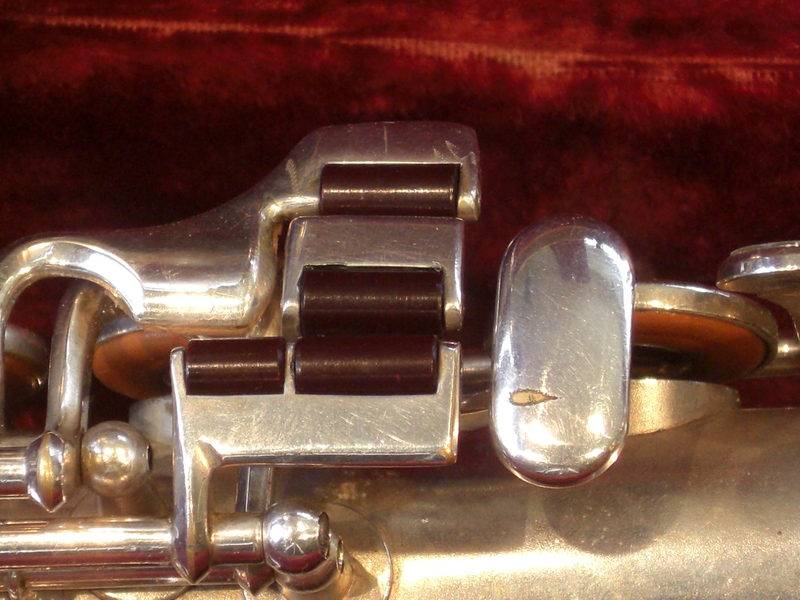 Typically the bottom keys of saxophone designs migrated over time from left to right, not least because left hand keys could be closed off by the right leg when players were seated. 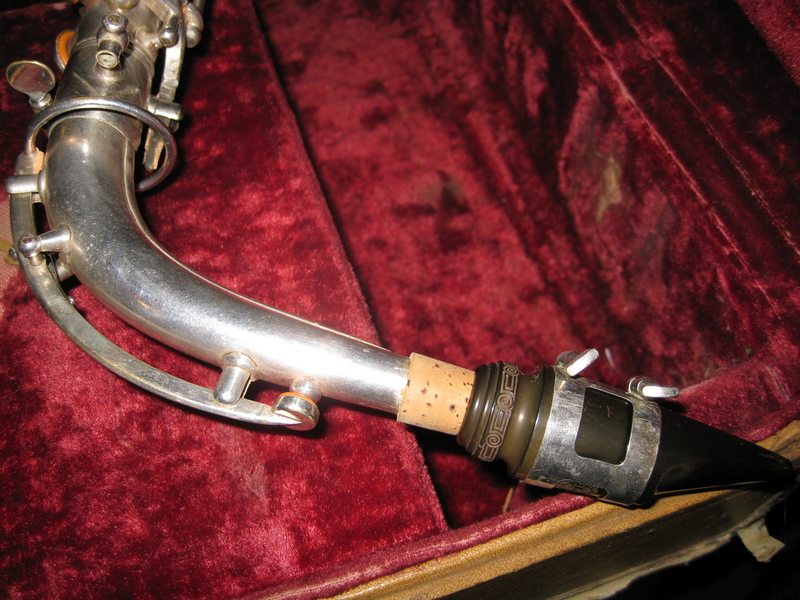 The horn came complete with a Selmer Sax-O-Mute as can be seen. 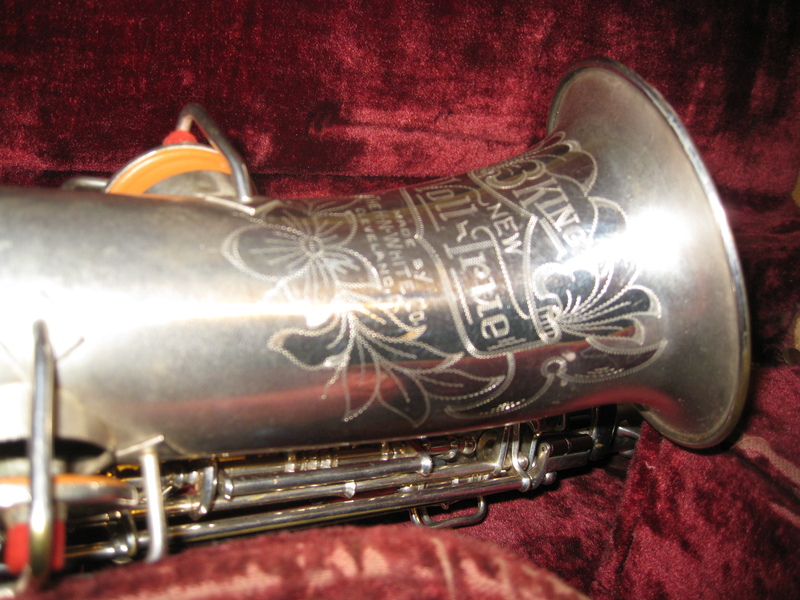 King saxophones went on to become some of the best blowers in later years. However this one is more of an antique. 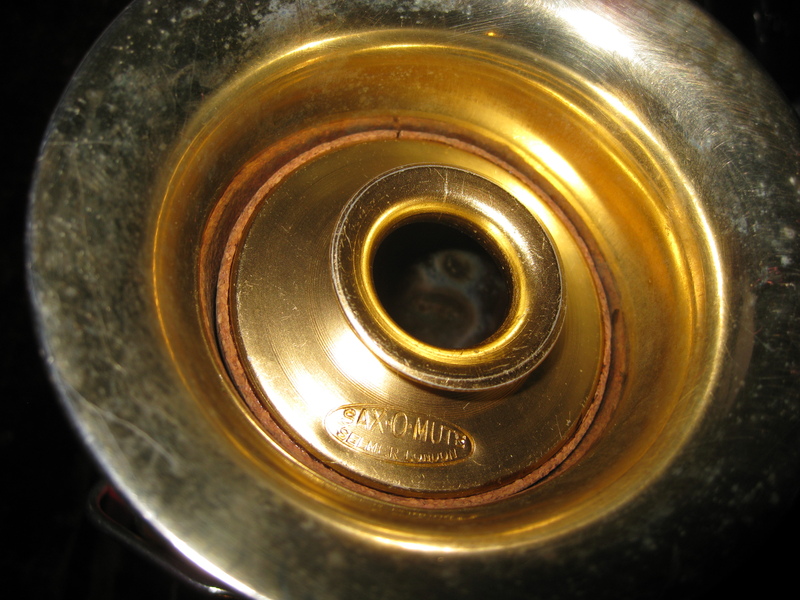 It is difficult to keep in tune in the upper register and is something of a ‘pea-shooter’, with a narrow bore restricting it from been blown like a modern horn. Despite this it is very enjoyable to play, reminding me of a classical instrument. It makes a very pleasant sound reminiscent of the 1930s – a time when saxophone technology had reached its peak. 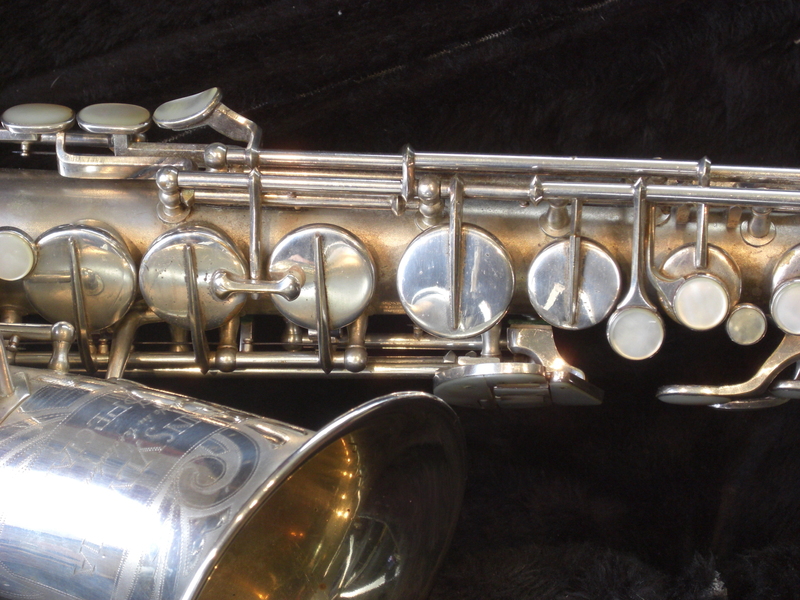 More about King saxophones can be found currently on the Web from Saxpics. Do you own a King saxophone? How do you rate it? Please let me know by commenting on this post. 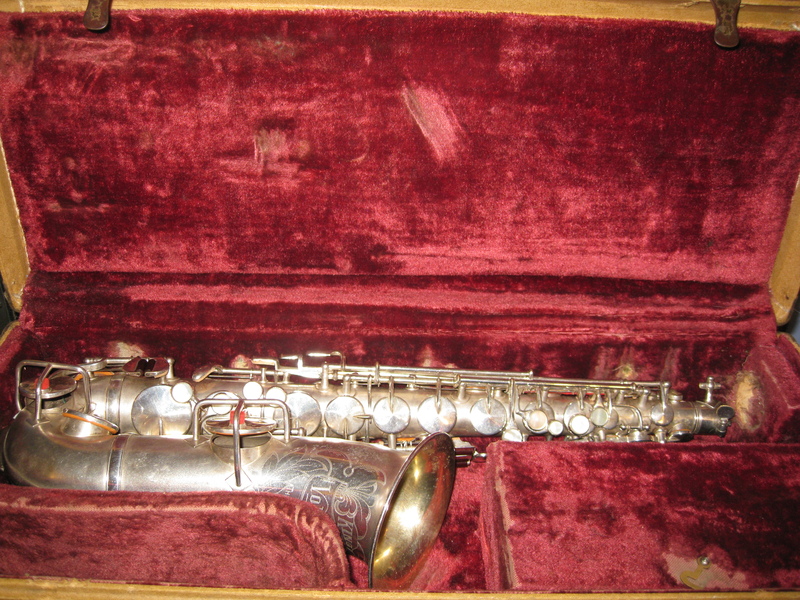 I am the owner of a King New Voll-True (alto sax) serial number 123709, how can I rate it?